Finding a caregiver for your elderly loved one can be one of the most important steps you ever take. Getting them companionship and support can help them live life independently, with the care and attention they need – while also giving you back time to rest, recharge, and refocus. But, as anyone who has attempted to hire a professional caregiver or service can tell you, getting started isn’t always as easy as it could be. First thing’s first, it’s important to determine what your loved one needs in terms of care. Figuring out what your aging loved one needs and wants is a great first step toward charting the course of action that will best suit them – and you. … then in-home care may be the best option! With non-medical home care, you’ll be able to give your loved one the support they need, in the comfort and security of their own home, without having to find a way to pay for or manage expensive, institutional care. It’s important to think about the tasks that your hired caregiver is going to be responsible for. 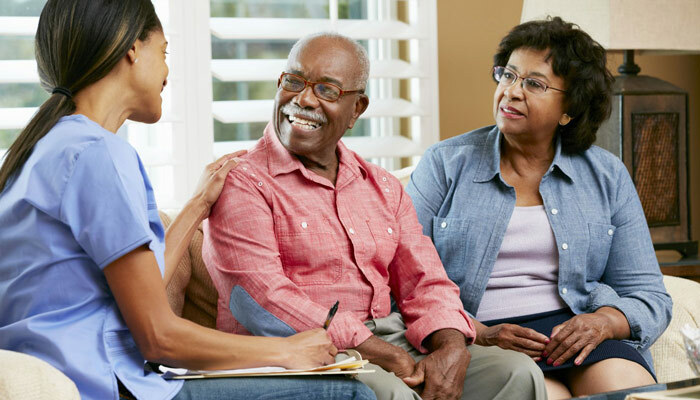 AARP suggests that you sit down and talk with your loved one, friends, and family, and think about the level of assistance your loved one needs, their physical and mental states, their preferences, and any guidance you’ve gotten from medical professionals. You’ll want to think about scheduling, as well – how often you’ll want your caregiver to come in and provide services, whether you’ll need help on a moment’s notice or on a set schedule, and so on. One of the most daunting parts of finding a caregiver may just be all of the research involved. We get it! After all, bringing a professional into your home is a huge step, for you and your loved one alike. It only makes sense that you’ll want to have everything handled, so that you can rest easy knowing that your older relative is safe and happy, and that they’re being given the absolute highest level of care possible. But with so many options out there, where can you turn? Ultimately, the answer will be different for every family. One starting point may be to talk to your friends and family. Today, millions of aging adults require care. You may have friends in a similar situation to you, with individual caregivers or agencies that have helped them out, and which they would recommend. It never hurts to ask! Don’t forget that local charities, community organizations, and religious organizations may also have recommendations or contact lists that might help. Whether or not you can get personal recommendations, your next step may be to turn to the internet. While the web is far from infallible, there are many online resources out there that can help you research and learn about caregiving options. For instance, review and listing sites like Yelp can be a great resource for seeing reviews and testimonials about service providers. Similarly, social media can be a great way to get a feel for a company. In addition to reviews and testimonials from past clients, see what kind of content they’re posting. Are they providing informative resources and creating value? Are they open and upfront about their services and their history? Is their contact information prominent, accurate, and easy to find? Finally, consider a prospective caregiver’s credentials. There are local, state, and national organizations dedicated to ensuring that caregiving services are up to snuff. For instance, is the agency or service you’re researching BBB-accredited? Are they registered with services such as ElderCare Matters, Care.com, or the National Association for Home Care & Hospice? These professional organizations and local registries can help connect you with caregivers, and may help you determine if you’re making the right choice. While you may feel that it’s time to help get your parent or loved one professional care and attention, they may not feel the same way. Often, the person in need of care may well be the person it is hardest to convince to accept help. They may be resistant to having anyone other than a member of the family act as a caregiver, or reluctant to accept a stranger into their home. In other cases, your loved one may flatly refuse to acknowledge that they need any help. Ultimately, the best way to move forward through a situation like this is to be open to hearing your loved one’s needs, while also maintaining your position. Ask questions and be open to hearing your family member’s honest answers; be compassionate and respectful; stress that you want to help your loved one remain independent; and be ready to provide reassurance or have information that can help assuage their fears or reservations. In some cases, your parent or family member may be willing to bring in help for “housekeeping,” rather than “caregiving.” This can be a way to get a foot in the door, and introduce your parent to a companion who they can build a relationship with over time. Similarly, you may offer to bring on a companion or caregiver on a trial basis, to see if it’s a good fit. At the end of a trial period, your loved one may be more than willing to continue on with care – or be more amenable to finding support from elsewhere, even if their last caregiver wasn’t the perfect fit. Should you opt for an individual, independent caregiver, or one who belongs to an agency or service? There are advantages to both options. For instance, with a home care service, it may be easier to get care at a moment’s notice. Services can also handle screening, hiring, background checks, and licensing/bonding, so that you don’t have to. As you begin to call, email, and even interview potential caregivers, it can be hard to know exactly which questions to ask to determine if someone has the right experience, or if they’ll be the right fit for you and your loved one. To help clear things up and give you a strategy, we have a guide on questions to ask a prospective caregiver, available here. How Will You Handle Payment? As you consider your caregiving options, you may also wish to consider how you and your caregiver will handle payments – whether that means cash, credit, or coverage through long-term care insurance. Good luck! Finding a caregiver for your loved one is one of the most important steps you can take – but we know it’s not always easy to get started. If you have any questions or concerns about finding professional help for your aging family member, don’t hesitate to reach out to Companions for Seniors! We’d be happy to field any questions you may have, and send you down the right path. We are locally owned in Chicago, Illinois, with clients in both the city and suburbs. All of our companions are trained, bonded, and insured, and we offer personalized care plans to ensure that every client’s specific needs are met. Companions are available on a full- and part-time basis, and offer assistance with activities of daily living, driving services, and more. Have any more questions about caregiving? Looking for an experienced guide? Ready to get started? Don’t hesitate to drop us a line or give us a call today!